The moment a rider attempted to wave as he rode past a speed camera turned to disaster as he lost control of his bike and ended up veering towards someone’s front garden wall. John Lynch of the Harry Middleton Cycling Club in Ormskirk was filming the ride, when the cyclist in front of him engaged in the ultimately dangerous manoeuvre after passing a roadside Gatso speed camera. The rider has been identified as Mark Titchener of HMCC, and Lynch reported that Titchener was thankfully uninjured after the incident. 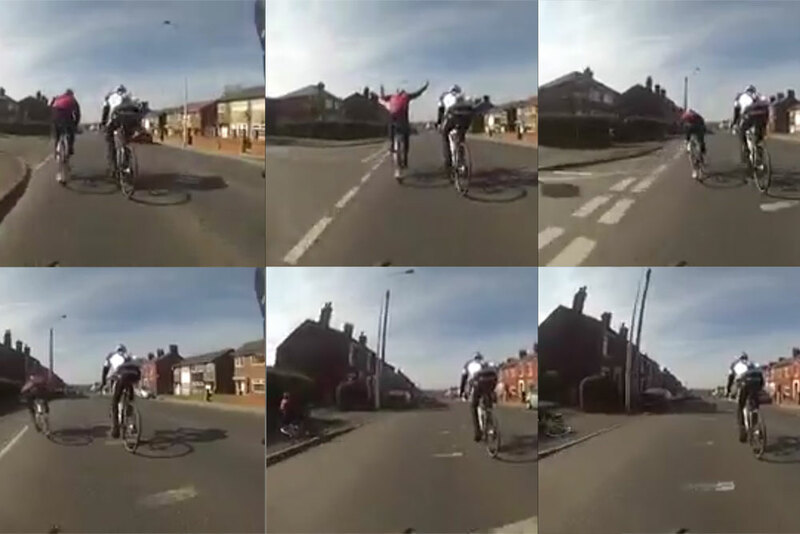 It’s far from the first time that a two-handed celebration has ended in disaster for a cyclist. Sportive rider Matt Adams found fame last year when his salute on Box Hill in Surrey caused him to crash into a grass verge. Unfortunately for Matt, he did so right in front of a photographer who captured the entire incident. And there’s also the classic YouTube clip (above) of an overconfident rider celebrating a race ‘win’ before unceremoniously dumping himself onto the tarmac. His rival then steadily rides past him to take the victory.